The 41st edition of Rallye Baie des Chaleurs is set to thrill fans and test competitors, thanks to a deep field of fast teams. 38 teams from all over North America have entered the third round of the Canadian Rally Championship, also a round of the NACAM series, drawing in three teams from Mexico. Joel Levac and Stephanie Lewis mark their return to the Canadian Rally Championship after competing regionally for the last couple of years. Racing a Prodrive-built Mini Countryman, the two won the event in 2016, beating out the factory-backed Subaru Rally Team Canada pairing of Antoine L’Estage and Darren Garrod who crashed out while leading the rally. This year, Levac and Lewis enter as strong favourites, after news that L’Estage and Ockwell – now running as privateers – are unable to secure support needed to run the rally. This opens up not just the podium at Baie, but also the championship battle. Simon Vincent and Hubert Gaudreau lead the points standings after back to back podium results earlier this season. The team hope a smooth and consistent pace will be the path to the title, but fast charging teams aren’t far behind. Second in the championship standings, Karel Carré and Samuel Joyal trail the leaders by just six points, thank to victory at the opening event of the season, Rallye Perce Neige. They have proven they’ve got the pace to be champions, but have taken risks to go fast that don’t always go unpunished. 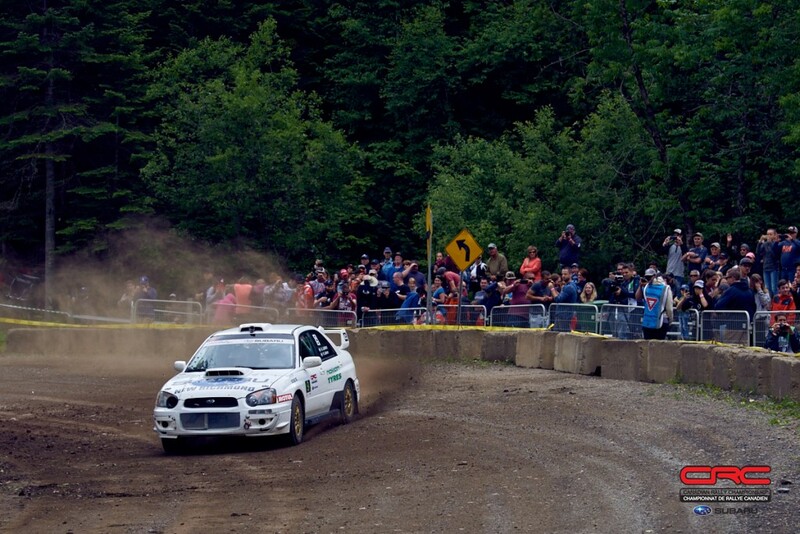 With L’Estage and Ockwell, as well as Rocket Rally teammate Brandon Semenuk absent from the entry list, teams familiar with the fast and demanding roads of Quebec’s Gaspé region could make their mark on the championship with a strong performance this weekend. André and René Leblanc are from New Richmond, and have eight points already on the board from Perce Neige. They’ve finished on the podium at Baie in past editions, and could move into championship contention with a good drive. Boris Djordjevic has reunited with John Hall, and are aiming to break a string of bad luck to prove their new car is ready for battle. Maxime Labrie and Anik Barrette are also back, having lead the championship for much of 2016. Provided they get into a rhythm quickly, the pair could land a podium result, ideally bettering two third place finishes at this event in the last three years. Jean-Sebastien Besner and Yvan Joyal finished third here last year, Besner’s first-ever podium finish at Baie despite a long and successful career in the sport. Three Mexican drivers are contesting the rally, perhaps with the pace to podium, though they will not impact the Canadian Rally Championship as they are entered in the NACAM series. Ricardo Trivino has contested Baie before, and this year will be co-driven by WRC veteran Marc Marti. Pancho Name and Armando Zapata along with Ricardo Cordero with Marco Hernandez are also capable of fast performances. Nicholas Spencer and Patrick Lévesque are leading the Production AWD class, but will have to battle against the team of Nicolas Laverdière and Vincent Trudel. Two wheel drive competitors Mathieu Leblanc and Éric Dubé share the points lead with Wim van der Poel and Bryan Lord. They’ll be keeping an eye out for Jason Bailey and Shayne Peterson who have yet to make a mark in the CRC points table. Americans Chris Greenhouse and Brian Johnson have been fast on the Baie roads before, but occasionally struggle with durability on the rough stages. Fans of John Munroe’s Corolla will find he and co-driver Bill Dubreuil entered in a modern Fiesta at this event. The Rallye Baie des Chaleurs is one of the longest events on the calendar, with more than 250km of stages snaking through the hills and valleys of the Gaspé Peninsula. A fan favourite, thousands come out to watch and cheer the teams at the Camp Brule and Saut du Cinq spectator areas. Follow all of the official live coverage here, and through the CRC Facebook, Instagram, and Twitter channels.